An artificial microbrain made from rat neurons has been created by plucky researchers at the University of Pittsburgh. 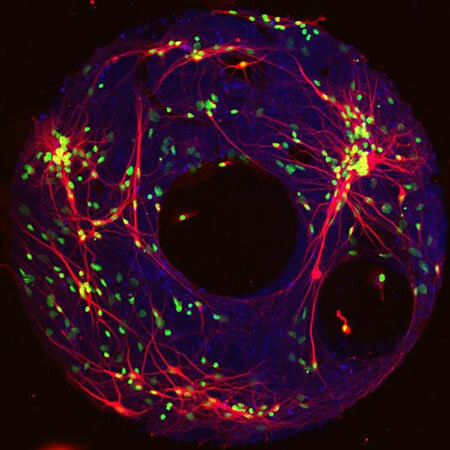 Take a look at this functioning toroidal microbrain in a dish below. To produce the models, the Pitt team stamped adhesive proteins onto silicon discs. Once the proteins were cultured and dried, cultured hippocampus cells from embryonic rats were fused to the proteins and then given time to grow and connect to form a natural network. The researchers disabled the cells' inhibitory response and then excited the neurons with an electrical pulse. Henry Zeringue and his colleagues were able to sustain the resulting burst of network activity for up to what in neuronal time is 12 long seconds. Compared to the natural duration of .25 seconds at most, the model's 12 seconds permitted an extensive observation of how the neurons transmitted and held the electrical charge, Zeringue said. "It's one of those smart gels," Ray said at last... "Head cheese. Cultured brains on a slab. From Ring-shaped neuronal networks: a platform to study persistent activity via ScienceBlogs.